It's June, can you believe it? Curiously, today's weather is quite spring-like today. It's now about 1pm and we're barely in the mid-70s. Early this morning, it was in the 60s. Anyway, moving on to today's recipe...I had been wanting to muster the nerve to try including green veggies in my smoothies for some time. Especially since I realized that throwing frozen yogurt cubes in my smoothies was a convenient way to get my 3 servings of dairy a day, it seemed like a great idea to throw in a veggie too. A few months ago, I bought a gigantic bag of kale and gathered a couple new recipes to try, but I wound up cooking it as a side dish one evening. A while passed and I actually stopped having quite as many smoothies--no particular reason, I just didn't make as many. Then last week as we were going out of town for the long weekend, I realized that we still had most of a bag of spinach left which would go bad. On a whim, I threw the whole bag with a banana, a cup of blueberries, some frozen yogurt cubes and enough milk to get the consistency I desired. It looked and tasted (mostly) just like a regular berry smoothie. It wasn't as a sweet as my usual smoothie, but that's likely due to the use of plain yogurt and milk instead of either juice or vanilla yogurt. I don't remember if I took pictures or not, but I'll post them later if I did. That early effort was successful enough to convince me to try other recipes. 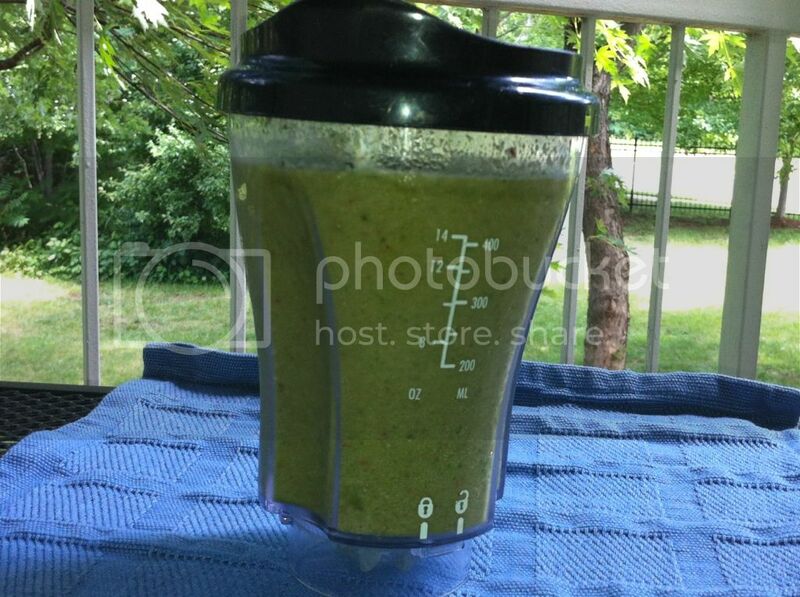 Today's smoothie creation is fantastic, although its color might be a bit off-putting to some. I swear that you cannot taste the spinach, only the sweetness of fruit with a hint of creaminess. I thought about putting it in a nice glass to photograph, but was too lazy (and I couldn't wait to drink it). At least I walked out onto the patio so the background was a little nicer, right? I highly HIGHLY recommend this smoothie, as well as the nifty single serve blender from Hamilton Beach that I mixed it in. In my blender, it's best to start with juice or some sort of liquid before adding the frozen goodies. 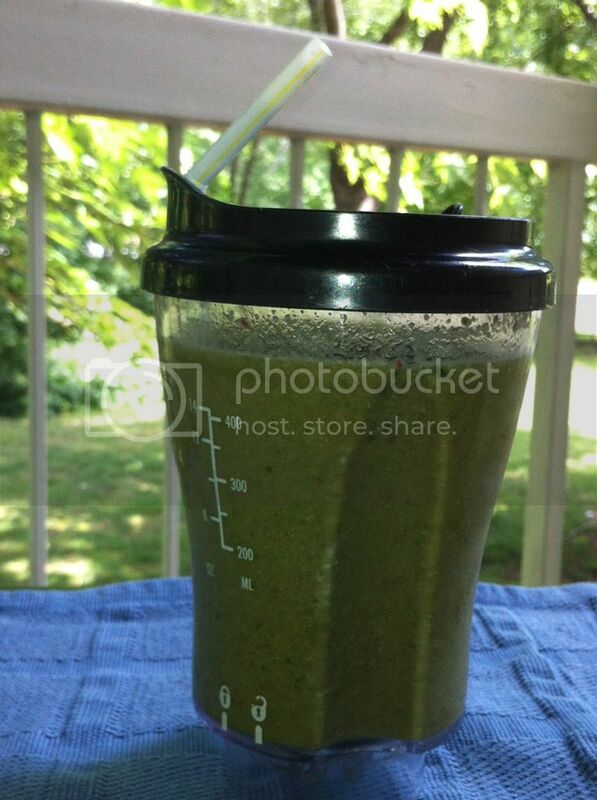 I layered juice, yogurt, spinach, and then strawberries. Blend until desired consistency is reached.